Irish-born Nahum Tate (1652-1715) spent most of his working life in London, where he was well-known as a poet and playwright. In 1692 he was named poet laureate, and in 1702 he was appointed the official royal historian. Today he is best known for having compiled (with poet/priest Nicholas Brady) A New Version of the Psalms, fitted to the tunes used in churches (1696). It was a collection of metrical paraphrases of the Psalms for use in worship. A Supplement was issued in 1700 which contained some new translations, as well as six hymns (as opposed to paraphrased Psalms) that were officially approved for use in worship. This was a striking novelty in the Church of England, which had long restricted congregational singing to the singing of Psalms. The sparse collection of hymns in this new publication included three hymns for use during communion, two for Easter, and one for use on Christmas. Only one hymn for Christmas. So much for myths about the good old days. That one hymn was “While shepherds watched their flocks by night,” a faithful paraphrase (probably by Nahum Tate) of the account in the second chapter of the Gospel of St. Luke of the angels appearing to the shepherds, From the time of its first publication until 1782, it was the only Christmas hymn approved for use in congregational singing in the Church of England. Only one hymn for Christmas. For over 80 years! Which brings me to this 1996 recording of eighteenth and early nineteenth-century English Christmas music. 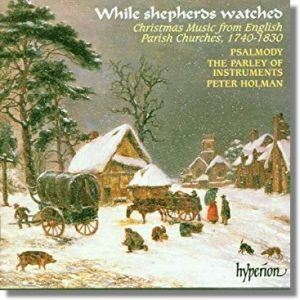 It is appropriately titled While Shepherds Watched: Christmas Music from English Parish Churches and Chapels, 1740-1830. It includes (only) four different settings of the singular hymn, along with performances of related hymns such as “As shepherds watched their fleecy care,” “There were shepherds abiding in the field,” two versions of “Hark! the herald angels sing” and one of its predecessor, “Hark! how all the welkin rings” (welkin being the vault of heaven). The album’s subtitle indicates that the selection of music here includes music from chapels as well as parish churches, so some of the selections are from the hymnals of nonconformists. But all of the music is performed in the style known as “west gallery music” or “Georgian psalmody.” The latter term is a reference to the era of the four Georges who ruled from 1714 to the 1830s. The reference to west galleries is an architectural designation. Many church buildings in this time included balconies at the west end of the nave, altars being situated at the east end. As many of these churches had no organs to accompany singing, choirs and instrumentalists would sit or stand in these galleries during a service, out of sight but certainly not out of mind as they plied their robust (and often primitive) music-making. Some aspects of west gallery music were exported to America. 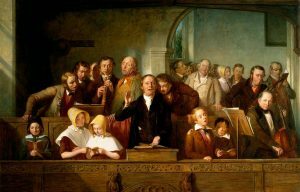 Similar musical conventions can be heard in the northern colonies in the music of the First New England School, which included William Billings (1746-1800), some of whose music our choir has sung. There are also likenesses in the southern styles of shape-note or Sacred Harp singing. On Epiphany Sunday our choir will sing an arrangement of “Brightest and Best” that owes a lot to these traditions. The performances on this recording are not meant to be an exact reconstruction of the way these pieces might have been performed by particular church or chapel choirs at the time. There is much that is still unclear to us about the performance practice of psalmody, and it would be futile to try to reproduce the low standards of ensemble and intonation reported in many contemporary descriptions of country choirs. . . . In general, we have tried to find a performing style that draws on the best practice of the time, and matches the directness and vigor of the music. The vocal group Psalmody was formed especially for this recording and consists of professional singers, teachers and students drawn from the Colchester area.